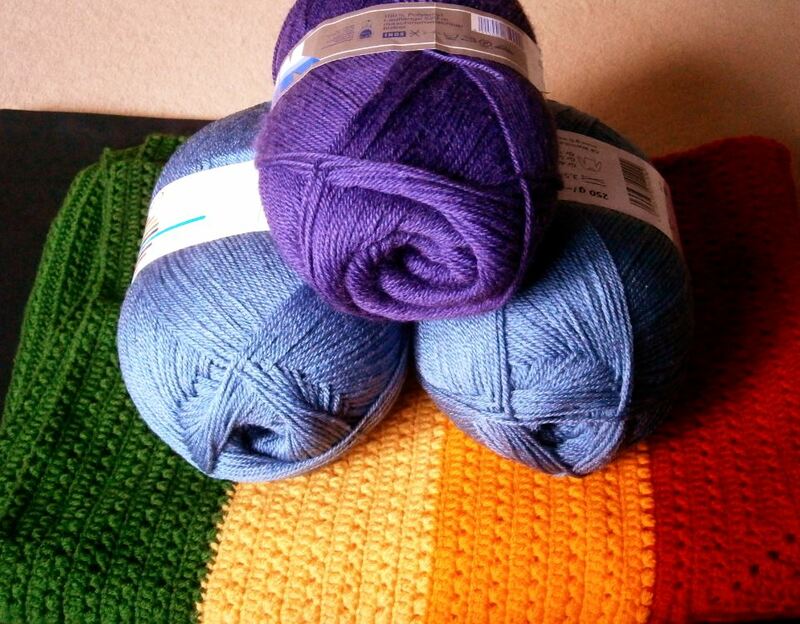 Finally found some blue yarn for my rainbow blanket. Not the exact colour I was looking for, it’s merely a grayish blue rather than the cornflower blue I wanted and it contains 20 % wool, but it’s the right gauge. Two balls at 250 grams each, a bargain from the local supermarket. The purple yarn is from my stash, three balls, 600 grams total. That’s what I just learned taking a peek around on my WP reader. Unaware of this, I’ve celebrated it already with my Coral of the month post, but there’s one more thing that came to my mind. Another UFO – this time from the crochet department – has been hibernating in my closet. If you still can call a 15 (or maybe even more) year long sleep ‘hibernating’. 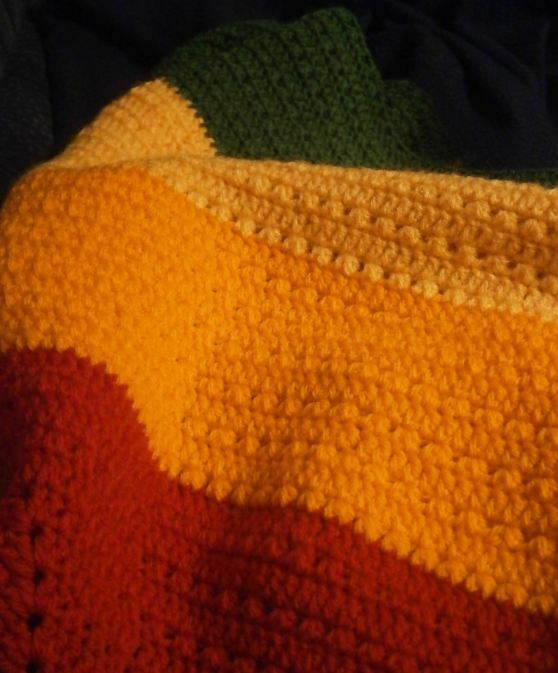 Time to finally finish my rainbow blanket. 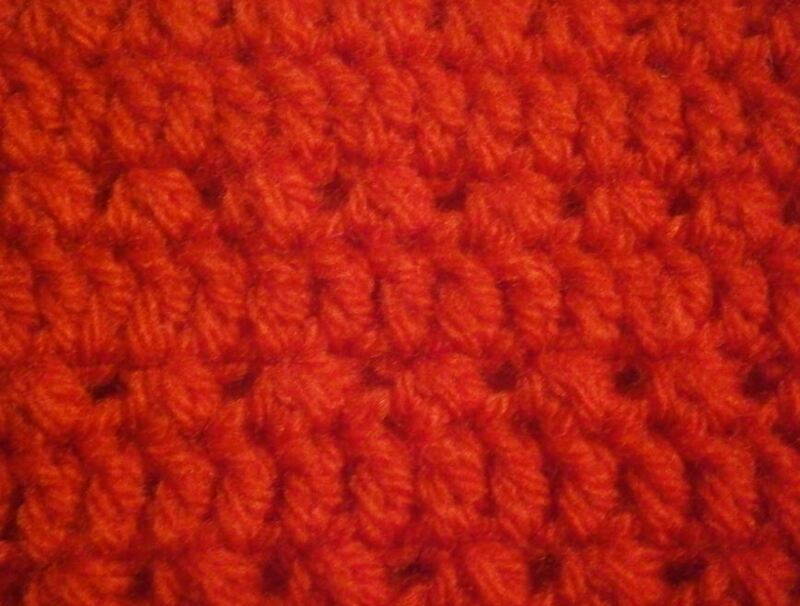 The pattern is simple – alternate rows of double crochets (dc) and two half double crochets (hdc, 2tog) followed by a chain. I’ve already got the purple yarn for the last rows, but I’m still missing the blue one. See if I can get any. I realized this with some awe. I was so busy doing and making all kinds of things, taking pictures on walks through my hometown, tried to cope with all the work at the office. I totally forgot about blogging here. Above is another treasure from The Boudoir. Seven cones in different colours from the box of leftovers at the local yarn store, bought a while ago. I had almost forgotten about them. The yarn is called Pierrot and is made of 100 per cent viscose. As you can see, it is very shiny and looks and feels a little like plastic. Handwash and no ironing, so perhaps something for some little art-y stuff. The label doesn’t tell me the needle size, but I estimate it’s about 4 – 5 mm (6 – 8 US, 8 – 6 UK, hook G or H). Let’s see if Ravelry have got it in their yarn database. – No, not yet. I’m going to add it later after finding out the correct gauge. I had already tried to make a cord using a knitting doll, but unravelled it because I didn’t like it.